We’ve all heard it said before that change is the only ‘constant in life.’ But if this is true then why do so many of us struggle with the changes we face in our own lives? Shouldn’t we all have ample opportunities to experience change and practice dealing with it? If we know that tomorrow will be different than today, and that at any given moment there are parts of our lives that will always be ‘up in the air,’ why does change continue to be so distressing for the vast majority of us? Let’s face it, change is not easy, but the uncertainty that accompanies it need not be horrific. Events of change do not need to be viewed as a negative happening for us. Instead, they can be seen as opportunities at finding even greater success through the new beginnings that will undoubtedly emerge with any given change. If we see the value of change, we can then begin to work with it rather than against it. During this workshop, your participants will gain greater insight into what change is, why the process of change can be so difficult, and how to embrace it instead of resist it. Participants recognize their natural reaction to change by accomplishing an everyday task in a different way. 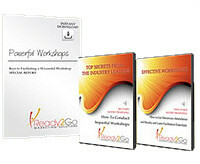 Participants identify their own life stage experiences and the changes that have occurred around them. Participants review the endings they have experienced previously in their lives and the mindset they now have towards change because of those endings. Participants uncover their current behavior surrounding change as a result of the mindset they have formulated over the years. 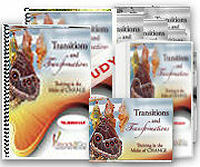 Participants understand the process of internal transitions when going through change. Participants explore what it takes to truly let go and become something else and they share successful stories of change. 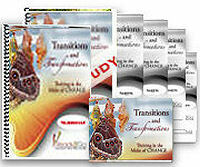 Participants understand the psychological experience marked by a release of new energy when beginning anew. Participants create a new picture of something from an old picture of something else as a metaphor for embracing new beginnings. By the end of the workshop, participants will be able to recognize what change is both outwardly and inwardly, and will be able to identify what must be done to successfully navigate the uncertainty of change. They will also be able to explain how the perceptions they hold around change affect their willingness to accept it, and they will realize the potential positive impact change can have on the growth and development of their lives. We experience change in large and small ways every single day. At certain points in life these changes can even be more intense than at other times. Yet even though we are continually thrown into the midst of change, our minds and hearts seem to yearn for stability and routine. Participants in this workshop will gain a greater awareness for what change truly is, the most successful way of dealing with it, and how they can be more trusting in the process of change despite its inherent difficulties. Discover our natural reaction to change. Define change both externally and internally. Identify the impetus behind change. Connect the certainty of change to given life stages we encounter in our lives. Determine the mindset we have around change and our default methods of dealing with the ‘endings’ in our lives. Ascertain our current behavior towards change.